As you approach Howe Caverns, located in Howes Cave, NY, near the town of Cobleskill in New York State's Central-Leatherstocking region, you may be impressed by the large "Howe Caverns" lettering on the lawn and the Tudor-style buildings that house the ticket window, seasonal café and gift shop. What you may not realize is that the natural attraction you've come to visit is completely out of view. Far beneath this imposing complex on a serene hilltop lies a wondrous underground world formed over the course of six million years. Tour groups board an elevator for a 16-story, 156-foot descent into the earth and step out into a limestone cave that is every bit the marvel it was in 1842 when farmer Lester Howe discovered it... with the help of his cows. Howe wondered why his cows didn't seek shade like other cows. They regularly clustered around a spot on his neighbor's property, a spot that, on the investigation, proved to be remarkably chilly. After hunting around in some bushes, Howe found the entrance to a cave, and on May 22, 1842, he and his neighbor, Henry Wetsel, entered the caverns for the first time. More than 14 million people have explored Howe Caverns since it formally opened to the public in 1929. On this photo tour, you'll see some of the distinctive features of Howe Caverns and discover tips to help you plan your own underground adventure. A stalagmite is a limestone cave formation that grows upward from the floor. The stalagmite in this photo, nicknamed the Chinese Pagoda, is the largest one inside Howe Caverns. Stalagmites and stalactites, which hang from the ceiling, grow at a rate of about one cubic inch in 100 years. That means the Chinese Pagoda, at 11 feet tall and 4 feet in diameter, is about 500,000 years old. It took Lester Howe and Henry Wetsel almost a year to explore the caverns' mile and a half of underground passageways by the light of a whale-oil lantern. In February of 1843, Howe offered his neighbor $100 for the property, and he opened Howe's Cave—the third commercial cave in America—for torch-lit tours. The tours cost 50 cents... and lasted eight to 10 hours. Today, tours cost quite a bit more than 50 cents, but visitors can see Howe Caverns in just about an hour and a half without donning hip waders. Regular tours are offered year-round. After a period of ownership changes, decline and closure, the Howe's Cave property was purchased by investors in 1927, and in 1929, it re-opened as Howe Caverns following construction of an elevator and installation of walkways and electric lighting. Since the cave was made accessible to visitors (although it is not handicapped-accessible), visitation has grown. Today, Howe Caverns is the second-most-visited natural attraction in New York State after Niagara Falls. In April of 2007, Howe Caverns was purchased for $3.7 million by two former shareholders, who announced intentions to invest $2 million in the attraction. 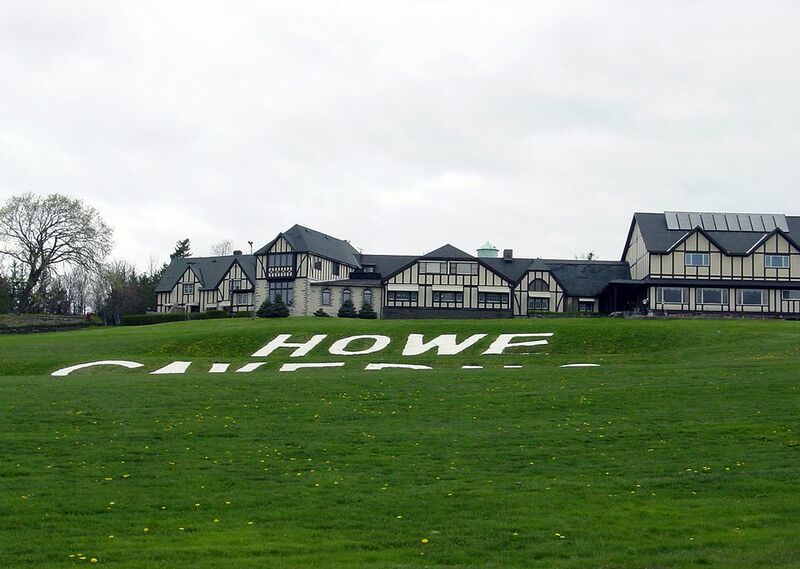 In 2011, Howe Caverns introduced several new attractions including an animatronic Lester Howe, who regales visitors with the story of his wondrous discovery, and Howe High Adventure, an outdoor ropes and zip line course. In 2012, this adventure park was expanded with the addition of a rock climbing wall and air jumper. Howe Caverns also introduced HC Mining Company, where visitors can search for gems, fossils and arrowheads. On June 8, 2013, New York State's first and the Northeast's longest H2OGO balls wet and wild ride debuted. All new in 2015, the two-and-a-half-hour Signature Rock Discovery Tour opened up a new passageway through the undeveloped cave, including some areas that hadn't been seen for more than a century. Another new attraction, Howe Dinosaur Canyon, has also been discussed for the site: If built, it will feature animatronic dinosaurs including a huge Tyrannosaurus Rex. When you visit Howe Caverns, be sure to wear comfortable walking shoes... and to bring your imagination. There are many distinctive rock formations within the caverns, such as this one named "Two Witches of the Grottoes." Can you see the two witch faces? The top witch has a rounded nose and a pointy chin. That pointy chin becomes the hooked nose of the second witch. Feel a chill? It's not from the spooky witches. The cave's temperature is a constant 52 degrees Fahrenheit year-round, so you may also want to bring along a light jacket or sweater. All tours of Howe Caverns include a short boat ride on the underground Lake of Venus. It's a one-of-a-kind adventure, particularly when you reach the end of the one-eighth-mile lake and your guide turns off the lights. Total darkness... where you can't see your hand in front of your face... is a unique and slightly disturbing experience. When loaded with a tour group of about 20 people, the boats, which had to be assembled inside the cave, weigh more than two-and-a-half tons. Guides propel and steer the boats by using their hands along the cave ceiling and walls. One photogenic formation deep within Howe Caverns is known as The Pipe Organ. If you look carefully, you can see that the organ's "pipes" are made up of stalagmites and stalactites that have grown together. The organ is coated with a layer of glistening flowstone, which is formed as limestone-laden water trickles down the cavern walls. The Pipe Organ is intriguing to view, but it's even more fascinating to hear. By humming into the "keyboard" under a canopy-like rock across from the formation, you can create a resonating sound within The Pipe Organ. Souvenir hunters of yesteryear who broke off stalactites exposed natural holes in the formation that create this musical effect. By the way... don't try to take a souvenir of your own. You'll be warned at the outset of the tour that touching the cave's formations is a big no-no. That's because cave formations undergo a process of continual natural growth that can be inhibited if disturbed. A Cool Place to Say "I Do"
The first wedding inside Howe's Cave took place near the cave's natural entrance in 1854 when Lester Howe's daughter, Elgiva, married Hiram Dewey. Since 1929, more than 600 weddings have taken place inside Howe Caverns at the spot in this picture, known as the Bridal Altar. If you're looking for a cool place to say "I do," Howe Caverns is certainly a unique place for a wedding. It's also quite affordable for brides and grooms on a budget. As of 2018, the fee to marry inside Howe Caverns is just $100 including admission for the bride, groom, best man, maid of honor and parents and children of the bride and groom (up to 10 people). Additional guests ages 16 and up pay $15 plus tax. For weddings, the bride and groom usually stand on the Bridal Altar's six-inch-thick calcite heart, shown in this close-up photo. It was cut from a large piece of calcite found in a stream inside the cave. During your tour of Howe Caverns, you'll learn that there is a bit of lore associated with this translucent heart, which is illuminated from underneath. If you are in a relationship, and the two of you stand on the heart, you'll be off on a long, romantic trip within a year. If you are unattached and you stand on the heart, the news is even better. You'll meet and marry your special someone within a year. Even if you don't stand on the heart, you might get kissed while you're at Howe Caverns. We're talking, of course, about "cave kisses." Your guide will explain at the outset of your Howe Caverns adventure that if you get "kissed" by one of the drops of water falling from the cave's stalactites, you'll have good luck for the rest of the day. In this photo, you'll see the entrance to the Winding Way, the narrow, twisting, final segment of the Howe Caverns tour. You can skip the Winding Way if you're claustrophobic, but you'll miss some fabulous scenes. Just be sure to watch your head and elbows. This 300-foot passageway varies in height from 5 to 45 feet and in width from 18 inches to 5 feet. While you're squeezing and ducking your way through the Winding Way, be sure to stop every once in a while to look up. You'll see some phenomenal sights and be reminded that you're surrounded by an underground compartment that took shape some six million years ago. The cave's limestone walls were carved over centuries by an underground river. Imagine the force of water required to cut through these rocks, leaving the ridged patterns and sculpted formations visitors see today. In this final Howe Caverns photo, you'll see the beautiful artistry inside the cave's Winding Way that has resulted from millions of years of water erosion. If these images have piqued your interest in planning a visit to Howe Caverns, here's everything you need to know before you go. Directions: Howe Caverns is located at 255 Discovery Drive in Howes Cave, New York. From New York City and points south, follow the NYS Thruway north and west to Exit 25A for I-88 West, then take exit 22 and follow signs to Howe Caverns. From Montreal and points north, follow the Northway (I-87) south to Exit 1W for the NYS Thruway (I-90) West to Exit 25A. Travel I-88 West to Exit 22, then follow signs to Howe Caverns. Additional directions are available at the Howe Caverns Web site. Hours: Howe Caverns is open year round. It is closed on Thanksgiving and Christmas Day, Tours are typically available daily spring through fall and Friday through Sunday in the off-season. Check current hours of operation online. Lantern Tours are offered for adults only (ages 16 and up) on Friday and Saturday evenings year round. Family Flashlight Tours are offered on Sunday evenings for participants ages 5 and up. Reservations are required for these two special tour options. Two-hour spelunking Adventure Tours and the Signature Rock Discovery Tour are Howe Caverns' newest tour offerings. Tickets: As of 2018, traditional tour fees are $25 for adults, $22 for seniors, $21 for juniors ages 12 to 15 and $13 for children ages 5 to 11. Children under 5 are admitted free. Discounted group rates are available. Lantern and flashlight tours are $35. Adventure Tours are $125 per person 12 and up; Signature Tours are $155 for 14 and up. For More Information or Tour Reservations: Call Howe Caverns at 518-296-8900.